Six makers, from Spain, Canada and the UK, were involved in the construction of the ‘startrap’. Basketry and Beyond promotes the sharing of skills and techniques. Fairly simple tools are needed to start making willow baskets; a bodkin, knife, rapping iron and secateurs. This basket of tools seen at the Festival 2013 belongs to Dieter Deringer. 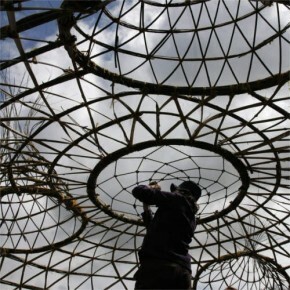 Completing the lid on a basket. This ‘fowl crate’ for transporting a live hen is a copy of one found in the Museum of English Rural Life that was originally made by Blackwells of Barnstaple. A demonstration of rush hat making at the Festival at Dartington in 2013. The English rush was cut in July/August in the river Isle in Somerset. The soft material is woven over a mould to keep the shape. The sides of this basket are woven using split and shaved brambles. The courses in February 2014 were supported by a grant from the Heritage Lottery. Made for the 2013 festival during the ‘Weaving Space’ artist’s residency supported by Arts Council England. Bamboo, willow and sisal were woven into a 7m x 4m structure using a technique found around the Mediterranean for making fish traps. 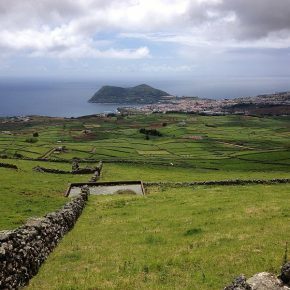 We are arranging a trip to Terceira. 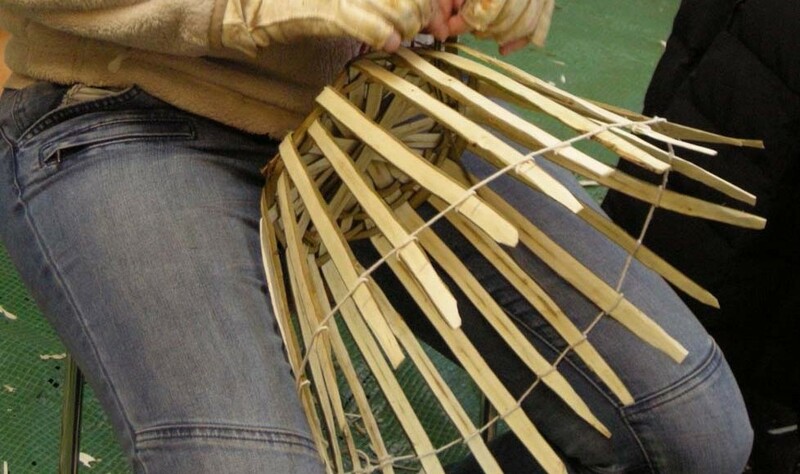 Experience Azorean basketmaking on a short course and discover this beautiful island. To find out more go to the Courses 2018 page.